Digicult has developed “+ 39:Call for Italy” for Cimatics Festival in Brussels in 2007, a modular project of live experimental AV performances, presentations and a videoscreening to promote Italian contemporary audiovisual art worldwide. The curatorial project borned with the aim to help Italian artists to present their artworks within the most important internazional events in the field of artistic and cultural transactions between digital audiovisuals, music, cinema and design. Cimatics is one of themost important European festival which offers audiovisual performances, concerts and installations. It gives an extensive overview of what’s taking place at the crossroads of music, media-art, cinema or design: live AV. Ignoring the borders of diverse disciplines, the festival combines sound and visuals, mixing art with pop into a celebration of digital culture. The project focuses on the develpoments in Digital arts in Italy in the last 10-15 years, related to the Italian tradition of the last century artistic avantguards movements. It introduces some of the most experimental and suggestive Italian musicians, designers, graphics, video makers, sound artists, vjs and audiovisual artists. “+ 39:Call for Italy” presents projects of Live Cinema, Audiovisual live set , Interactive and Urban installations, Vjset and a Video Screening curated by Claudia D’Alonzo of some of the most talented Italian video makers, video artists and graphic designer. The potentialities of the screening reside in the ample and complete vision of all forms of creativity associated to videomaking, videoclips, audiovisual synaesthesy, research, graphic animation and illustration. After Cimatics Festival, the project “+ 39:Call for Italy” was also commissioned by some other important festival in Europe and worldwide like Strp Festival in Eindhoven in 2008 (in which Otolab and Echran performed, while Marco Mancuso lectured), Nemo Festival in Paris in 2008 (in which Otolab, Quayola and Mylicon/En performed), Transculture Audiovisuelles in Lille in 2008 (in which Mylicon/En performed and the Videoscreening were projected), Sonic Acts in Amsterdam in 2008 (in which Otolab performed) and Elektra Festival in Monteral in 2009 (in which Otolab performed as well). Following the Italian cultural tradition in design and project, extending it to the ultimate forms of audiovisual art and creativity linked to the usage of new and digital media, the exhibition “+39” wants to be a breathing space on the artistic evolution of some among the most representative protagonists of the most recent Italian electronic scene. Without any celebratory ambition, conscious of the intrinsic value of the presented works, the exhibition “+39”, articulated through a series of performances, video exhibits and urban installations, is the first retrospective on those artists, musicians, designers, videomakers, vjs and programmers who, in the last 10-15 years in Italy, have consciously developed languages and easthetics within an ever-changing and spreading cultural ambit. “+39” is therefore the first opportunity for a whole movement of professional Italian creatives working in the digital domain to get together and be acknowledged as a proper scene. The term is abused of, loved and hated, still it is indicative of a cultural-artistic current, of common ideological-creative grounds that unite human and professional experiences, contexts and ambits that are sometimes very far apart. The Italian scene is ready for international confrontation. Far from being exhaustive, “+39” wants to uncover the existence of a movement, show an imagery, highlight work and project methods that are linked to the country and its protagonists. The conscious spectator shall then recognize traces of Italian experimental video art tradition in the live-cinema project Put down the gun by the duo Mylicon/En, wonderful attempt of micro-narratives and figurative suggestions to seek an additional interaction between audio and video, in which an important role is played by the contrast between images produced by totally analogic tools and an electro/digital sound produced by laptop or synthesizer. Internationally representing Italian design applied to new technologies, code, audiovisual research and interactivity, Op7 – an audiovisual performance by the Otolab collective – reinterpreting optical art with a strongly synaesthetic approach that links electronic music and visual scenography. Morover, the live audio-video project Path to Abstraction by Quayola rappresenta uno tra i più validi esempi di come la scuola Italiana del graphic design, del video arte e della musica elettronica si sia evoluta nel nostro paese grazie al contatto con esperienze accademiche da un lato e con la cultura underground dei club dall’altro. Finally, ZimmerFrei, a group that produces theatre and dance performances, short movies, audio installations, presents the performance The Colony, proposed as a live expanded cinema: the video is projected on a screen and the soundtrack is played live by ZimmerFrei (turntable, samples, toys, noises and voices) and two guitarists. The “+39: Call for Italy” project is rounded off by a rich and varied video screening curated by Claudia D’Alonzo. The potentialities of the screening reside in the ample and complete vision of all forms of creativity associated to videomaking, videoclips, audiovisual synaesthesy, research, graphic animation and illustration. Niko Stumpo, Fabio Franchino, Blu, Mylicon/en, Zimmerfrei, Hfr-Lab, Progetto Antenna, Virgilio, Vinz Beschi, 47th Floor, Elec are some of the featured artists within a project that will eventually be released on DVD. The Videoscreening represents an overview of the contemporary audiovisual scene in Italy through the works of 13 authors. The interaction between sound and moving image is the common denominator of these works, whose makers act in fields sometimes far apart. The artists have been invited by Digicult for a collective confrontational opportunity to picture a fertile and multiple scenario, to find common grounds in the varied Italian electronic audiovisual production of these last years. The screening features works going from video art to animation, from graphic design to videoclips to audiovisual synaesthesy, presenting a range of approaches and methods so as to follow the different tinges of meaning around what is referred to as ‘audiovisual’. The videoclip is one of the audiovisual means of telling a story. Which is what happens in The rain and Spiritual Healing. The Rain, born as a collaboration between videoartist/maker Virgilio Villoresi and the illustrator Ericailcane, use the stop motion technique to create an environment of small things, traces of a delicate tale around desire, accompanied by the sound of Lou Rhodes (Lamb). Spiritual Healing is another videoclip, produced by a group of graphic designers and videomakers called 47th floor, with music by Zu: a gothic voyage that reminds of Hieronymus Bosch’s crazy and distorted worlds. The stop motion technique is also reinvented by the duo Elec in Un re del mondo, taken by an installation where sequences of photographs of a mechanic being become a video whose mounting is controlled by sound, thus giving life to one only piece that constantly deviates from predictable schemes, never repeating itself. The video Fino by Blu (ex-member of OkNo collective) looks like and escherian fairy tale. The illustrator uses animation to create a never-ending drawing whose shapes generate other shapes. 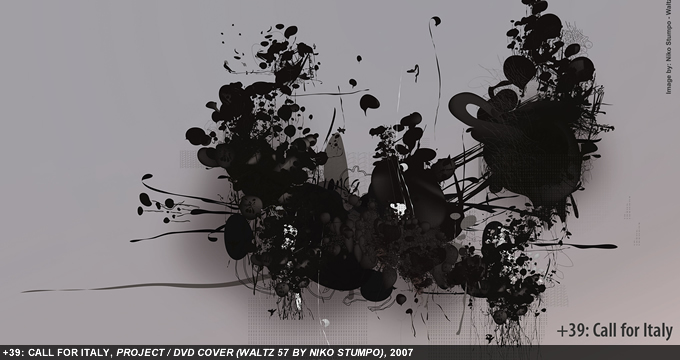 Waltz 57, by illustrator, web-designer and film-maker Niko Stumpo creates, instead, a link between computer graphics and animation putting up a carillon of abstract shapes that dance in a visionary, dissolved environment. Graphic design is also the easthetic reference for the video Forming, by the group Progettoantenna. They investigate around the thin line separating creation and decay of a shape using the 3D technique: lights and shadows trace, cut and develop figures that are, at the same time, full and empty within a great liquid movement able to limit and recreate. ZimmerFrei, from Bologna, unite theatre, music, live cinema and performance under a common idiom, exploring time and its perception, a main issue in videoart. Their work, Sodium Pentathol, is a camera-car subjective sequence-shot taken in Brussel’s bypass ring. Fabio Franchino, an artist that ranges from video to generative art, presents the video Am i Born?. A work where sound controls image thanks to a self-produced software, creating a poetic and intimate abstract path among inlaid shapes, lights, skin and body. Ogino Knauss, who have been pioneering research on the urban tissue transformations using video, vjing and live cinema, are present with Quantize This, taken from an installation of theirs which was commissioned by Domus magazine for San Siro stadium in Milano. It is an investigation on the city of Milano using the concept of the ‘number’ as a sign that characterizes this city, ruling over its times of life. Urban landscape is also the main theme in a video series called City Scan, by Hfr-Lab, a multidisciplinary and experimental group. Architectural elements become audiovisual modules to be mixed and interweaved according to a practice which is half-way between graphic design and vjing. From the livemedia scene, a work called Infonaturae 1.0. It is a collaborative work between musician Emanuele Errante and videoartist Mattia Casalegno, where sound paths and ever-changing pixels create a morphogenesis on the brink between organic and inorganic. Oakland, a video of group Mylicon/en, whose production is an original mix of digital abstraction and physicity, is also performative. The original TV source dissolves and is layered so as to become a flow of colours and sound. The exhibition finishes with the video Strip Melody, by videomaker Vinz Beschi, who builds a complex score in the piece Stripsody di Cathy Berberian composing plugs and video fragments that use facial expressions of bewilderment along with onomathopeic comic-book sounds. Vinz Beschi realizes therefore a very original piece where voice, images, words and rhythm become elements to deconstruct and re-use.